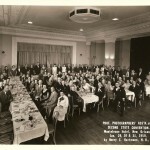 2017 marks the 68th Anniversary of the Professional Photographers of Louisiana, Inc. Through the years, many individuals have contributed to its growth, some have been remembered, but many have been forgotten. This document is an effort to assure that they are not forgotten forever. information about the present which will become the history of the future. Below is a reprint of the only real historical document that we have. This history was originally published in the 1980 Directory. We are reissuing this history so that the names of those who have contributed so much to this association and who are the reason this association exists, will never be forgotten. We hope that in a future issue of this publication, that photographs of these individuals can also be provided for historical reference. – On April 1, 1947, 33 photographers joined together, paying dues of $10.00, and formed the Professional Photographers Association of Louisiana. Serving as president of the PPAL, which evolved into the PPLA, was Leon Trice, Jr. of New Orleans; who served until February 1949. – In the short period of one year, the 33 charter members, mostly from the New Orleans area, saw membership grow to 50 and encompass photographers from throughout the state. In 1980, total membership was 205 among the various classifications, with 121 Active Members. 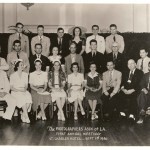 – The group held its first convention in 1949 and elected Phyllis Moore, M.Photog., to succeed Trice, and the name became the Professional Photographers of Louisiana. – At the convention of 1953 Leon M. Trice Sr., M.Photog.,was elected president. He was among the earliest visionaries of a state association of professional photographers. He and the late Charles L. Frank attempted to form such a group as early as 1938, when they canvassed the state soliciting members and collecting dues of $3.00. 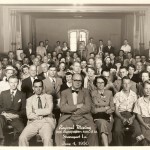 – These people supported a bill in the state legislature to legalize a state license for professional photographers. The story goes that certain individuals in the legislature opposed the bill and defeated it. With the defeat and the beginning of World War II, the efforts to organize state photographers apparently died until 1947. – The second attempt met with success, and the group adopted a Code of Ethics and By-Laws containing 19 Articles at the 1949 Convention. The By-Laws and the Code of Ethics served as the guide until 1960, when the group was incorporated on January 27, 1960, under its present name. – Serving as President then was John E. Kuhlman, M.Photog., who later served 15 years as Executive Manager until his death in 1978. – Serving with him were David M. Hunt, Vice President; Frank Lotz Miller, M.Photog., Secretary-Treasurer; and F. F. Randon, Jr., Ex-Officio. Don D. White, M.Photog., was the By-Laws Committee chairman. 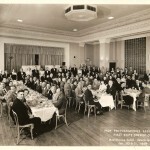 Members of the Board of Directors included W. C. Alexander; John C. Guillet, Jr.; A. J. Rybiski, Jr.; Jo White, M.Photog. ; and N. R. DeGravelles, M.Photog.,Cr. ; and Past-Presidents Phyllis Moore, R. William Long. L. M. Trice, Sr., and Lee Webb, M.Photog. – The By-Laws were revised at this time and, along with the Articles of Incorporation of 1960, served until being revised again and approved at the State Convention in Bossier City in October 1979. Leon Bolen was president of the thirtieth convention, the first to be held outside of the New Orleans area. – Following this convention, a special election was called to elect additional directors for Districts One, Five,and Six, whose memberships had grown sufficiently to justify an additional director. With the addition of these three directors, the Board was expanded to twenty, including the Executive Committee, composed of the officers of the association, the ex-officio, and a representative from the Past Presidents Advisory Council. – The Executive Committee was authorized by the Board of Directors following the death of Kuhlman, to handle the operation of the PPLA. It was established at a special meeting of the Board of Directors in March 1979 in Alexandria. Additional historical information not included in the 1980 association history. – In 1997, the association was restructured with several districts being combined. The association went from a seven district division of the state to the current four district arrangement we have today with two directors representing each district. The current Board of Directors is made up of 13 members; 8 district directors, President, Vice President, Secretary-Treasurer, the immediate Past President, and a Sustaining Member Representative. Additional historical information will be added as it becomes available and has been verified for publication. This document will be an ongoing “work-in-progress” in perpetuity, as is history itself. We hope, at some time in the future, to create a chronology of PPLA’s history. Prior years officers are invited to submit chronologies of prior years for this history. We are starting it off our yearly chronology with a synopsis of the significant events of 2009-2010. The 2009-2010 term saw a lot of changes take place in PPLA. In 2010, the long dormant PPLA John Kuhlman Scholarship was finally revived and was financially endowed by the 2009-2010 PPLA Board of Directors to assure that the scholarship can be awarded each year. In addition, the use of scholarship fund drives was approved to increase the future endowment and to assure that the scholarship will remain sustainable into the future. 2010 saw the revival of our long dormant PPLA State newsletter.”Miniatures” in a new electronic form called “eMiniatures”. The impressive revival issue of “eMiniatures” was released in the Spring of 2010 with electronic issues to be published on a Quarterly basis. The PPLA Fellowship program was also revamped with a new “State Merit” program being developed and two new “State Degrees” being created to act as “stepping stones” towards the PPLA Fellowship. The State Degrees established are a new PPLA Service Degree and a new Imaging Artistry Degree. The new program requires that a member earn both degrees in order to be eligible for the Associate Fellowship. The Full fellowship requires double the number of state merits in each category (Service and Artist) to qualify. Also new in 2010, a series of committees were established in order to create more opportunities for the membership to become involved in the running of the association and earn “State Merits” towards their State Degrees and PPLA Fellowship. A By-Law committee was formed to review and suggest revisions to the by-laws to assure that our by-laws were in compliance with the Articles of Incorporation. The PPLA by-laws were revised and the revisions approved by the membership at the Spring Seminar General Membership meeting in Marksville. By-Law issues addressed were: the changing of the election years for officers to re-establish the one-director each year offset election schedule originally set down in the Articles of Incorporation; the change of the status of the Sustaining Member Representative to the Board from a full voting member to an advisory position to comply with the specifications of the Articles; the establishment of a new “Aspiring Member” classification of membership; the approval of the use of electronic communications in place of the traditional U.S, Mail; and the re-establishment of the Past President’s Advisory Council and the installation of the PPAC Representative (who is elected by vote of all living Past Presidents) as a voting member of the General Board. In addition, as a means of increasing the overall participation of the Northern part of the State, PPLA was instrumental in the formation of a new North Louisiana Professional Photographers Guild to provide regular educational opportunities to the Northern part of the state. PPLA subsidized the formation of the Guild by providing the PPA Speaking Merits for the North Louisiana Guild for it’s first year of operation making it possible for the North Louisiana Guild to be able to attract speakers for their monthly meetings. On the down side, 2010 saw the passing of one of PPLA’s oldest and most loyal supporters, Ralph Plaideau, Sr. Ralph was the founder of Primary Color Lab and a loyal PPLA Sponsor for over 50 years. Ralph received the National Award from PPLA in 1978 and was a PPLA Honorary Life member. Our association will be forever lessened by his passing from us.